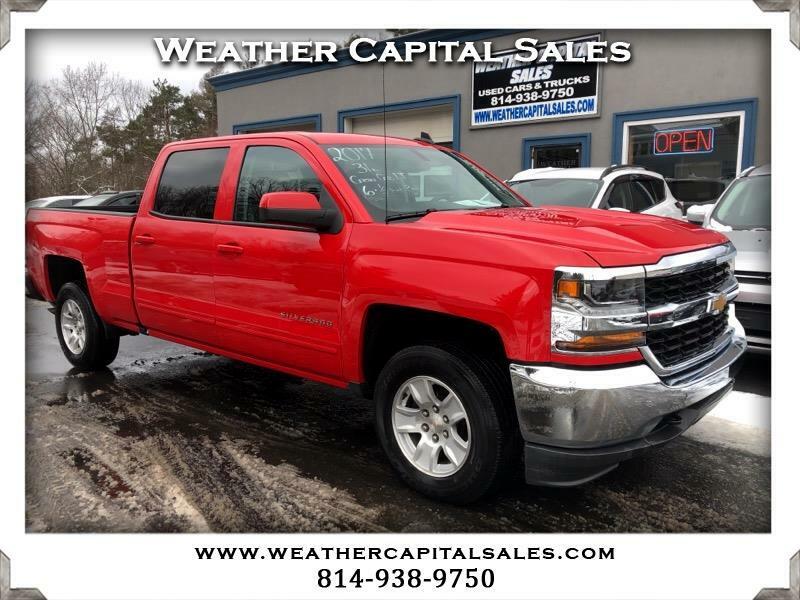 A 2017 CHEROLET SILVERADO 1500 CREW CAB LT 4X4 WITH A 6 FOOT 8 INCH LONG BED FOR ONLY $30,995.00! THIS SILVERADO IS VERY CLEAN INSIDE AND OUT. ALL 4 TIRES ARE BRAND NEW! WE HAVE FULLY SERVICED AND INSPECTED THIS CHEVY AND HAVE INCLUDED A GENEROUS WARRANTY AT NO ADDITIONAL CHARGE. THE REMAINDER OF THE FACTORY WARRANTY ALSO TRANSFERS TO THE NEXT OWNER. EQUIPMENT INCLUDES A 6 1/2 FOOT BED, ONSTAR, BACKUP CAMERA, SPRAYON BED LINER, XM RADIO, AND MUCH MORE. THIS TRUCK RUNS AND DRIVES GREAT! CALL US TODAY.